(1966) It's Country Time Again! It's Country Time Again! is an album by American country music artists George Jones and Gene Pitney released in 1966 on the Musicor Records label. It's Country Time Again is the sequel to For the First Time! 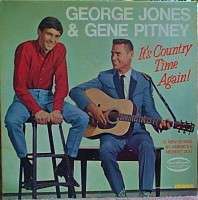 Two Great Stars - George Jones and Gene Pitney, released the year before. It was not as successful as its predecessor, however, rising only to number 13. The album is noteworthy for featuring the Jones hits "Love Bug", "My Favorite Lies" and a duet of "Why Baby Why", Jones first hit from 1955. It's Country Time Again also includes "That's All It Took", a song that Jones fanatic Gram Parsons would record with Emmylou Harris on his debut album GP in 1973. The Bear Family record label would reissue both albums under the title George Jones & Gene Pitney, collecting 31 sides that the pair recorded together.